A brief overview of things the Media Co-op does. To find out more or become a member, click here. 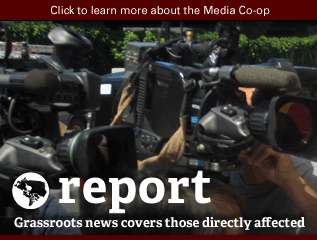 More than just another publishing project, the Media Co-op is part of a long-term plan to create an alternative to the existing corporate media. Both privately owned media (like the Globe and Mail or CTV) and public broadcasting (CBC) operate in a top-down manner. A board of shareholders or government appointees appoints an executive, who set the overall direction of the news. These executives hire and fire staff, and choose where resources are allocated. 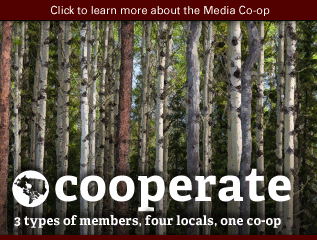 The Media Co-op aims to create an uncompromisingly democratic structure by allowing readers, journalists and editors direct control over the cooperative through an elected board. We've decentralized our operations, maximizing access to decisionmaking through locals. We're also working to create a culture of transparency and participation, through regular reports and consultations with our members. To find out more or become a member, click here. Corporate media is dependent on advertising. Public broadcasting is dependent on government funds as well as advertising. Most progressive outlets rely on grants or contributions from large organizations. 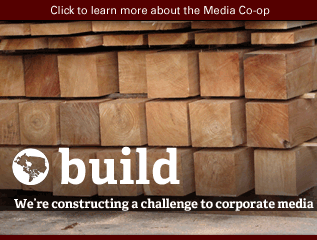 While the Media Co-op runs some ads, we work hard to ensure that the majority of our funding comes from our members. This allows us to be accountable to the people who rely on us for information, and not other interests. For us, this is what makes independent media independent: the ability to walk away from any given advertiser or funder who tries to interfere with our coverage. A big part of what we do is provide training for our members and for the public. Our goal is to cultivate journalism skills in communities in order to increase our capacities to share information directly, without intermediaries who might have other priorities or interests. Grassroots journalism starts with the people who have been directly affected by policies or activities. They are often the most important part of the story, and they are also more likely to tell the truth than the mouthpieces of entrenched interests. Once a journalist thoroughly understands the story of those directly affected, she brings their questions to those making the decisions: politicians, corporate executives, and so on. This approach stems from a certain kind of common sense: if we start by talking to the people who have a vested interest and experience in spinning, framing or outright lying to their own advantage, then we're not likely to get the real story. This approach also takes the position that what is actually happening on the ground is more important than what influential people are saying about what's going on. 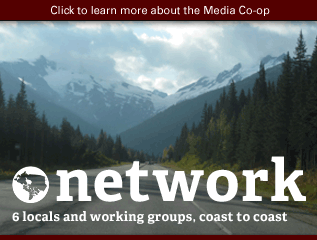 The Media Co-op provides a national platform for local stories, bringing local news from a local perspective to our members from coast to coast to coast. 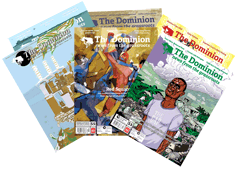 Our print project, The Dominion, brings grassroots voices to the fore in a national magazine now in its 10th year. 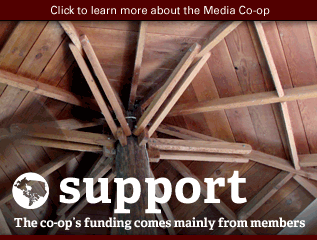 The media co-op is funded by our reader members, and created by our contributor and editor members. We are a network, with local collectives in each of Halifax, Montréal, Toronto and Vancouver. Each member type and local has representation on our board of directors. Members are encouraged to give input on story ideas as well as participate in setting our budget priorities and electing our board of directors. Our sustaining members, who give a monthly donation to support grassroots, independent news, are our financial backbone. We do receive grants but have chosen to build a funding model that does not depend on governments or foundations for our core funding. The fact that we are a co-op means our structure is a far bit more complex than that of a typical, top-down news organization. Decision making around what articles are paid for and what content is included in the magazine takes places collectively among our editors, who coordinate via phone and internet to produce The Dominion and maintain our various websites. 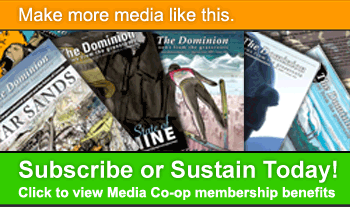 The Media Co-op is a national structure that produces a bi-monthly newsmagazine called The Dominion. Four locals have been created, beginning with Halifax in early 2009, followed by Vancouver, Toronto, and finally Montréal. Each local makes decisions autonomously, but by being part of a national network are able to get their news out to a wider base of readers. 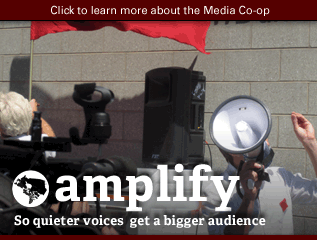 There are currently two working groups of the Media Co-op, in Ottawa and Sudbury. Eventually, we would like to see the project expand and have locals in more areas, but we have been taking slow and steady steps instead of rushing to expand. Working groups represent the first step by local media activists on the road towards becoming a full blown local. 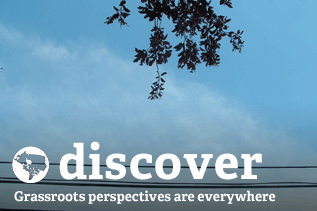 The Media Co-op is a great place to connect with alternative perspectives and outlooks. It's a place where issues that aren't discussed in the mainstream come to the fore, and where people are likely to find alternative viewpoints in what's happening in the world around them. 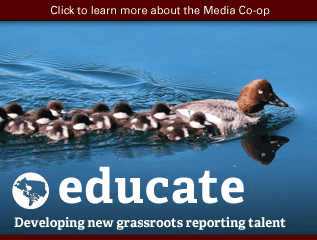 The Media Co-op is comprised not only of readers from coast to coast, but also of a growing network of contributors from across the country. We work with all kinds of contributors, from career journalists to first time writers, as part of our goal to ensure a variety of voices in our publications.